An easy-to-use, fast-acting, long-lasting flea and tick preventative, Seresto™ is a collar that promises a whopping 8 months of continuous protection. 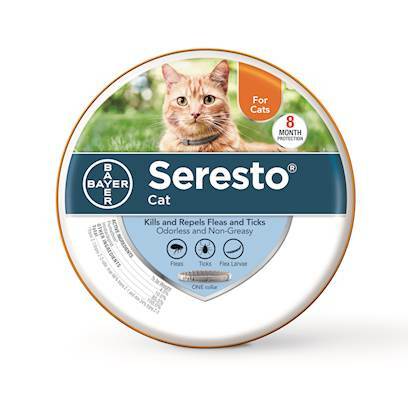 With all the protection of a topical combined with the ease of a collar, Seresto™ might be the perfect choice for your cat. Rated 4 out of 5 by 1713 reviewers. We were hoping for greater success with this product. This product definetly worth the cost. This is the best collar I have ever bought! The collor is very easy to use. It goes on easy and stays put. Easy to use and effective. Best product I have ever used by far! Alice is doing MUCH better! Easy to use with great results. The Seresto collar is very convenient. Welcome the 8 months of coverage! It is working quite good. Not a single flea on either cat and they don't mind the collar at all! My dogs still have visable fleas. It doesn't work as great as I had hoped! Still had to pull wood ticks off my Raven. Keep ticks out of the house! Product doesn't perform as advertised.